The first and probably most common place people consider using a key hider is your car. This option can save you time, and money if you happen to lock your keys in the car. Most are made of plastic and use magnets to secure the box to your vehicle. There is one that's a nylon case and uses velcro, and that is also a decent option. If you decide to use one, you need to find a good, non-obvious place to put it. You don't want a crook to be able just to feel around your wheel well and find your key, so look for a place to hide it underneath the car. Look for a box with a strong magnet. All of these boxes are not created equal. Obviously, you want to place it on metal, or it won't stick. Be aware that you do not want to put it on metal that has an undercoat on it. That's the rough looking rubbish coating that protects the underside of the car from rust. A smooth, painted surface is excellent, but undercoating is bad. It keeps the magnet farther away from the surface of the metal which dramatically reduces its holding power. Also, most cars have transponders in them for vehicle security. This "chip" talks to your car's computer and tells the car that it's ok to start. DO NOT EVER hide one of these on your vehicle! If a thief finds it, they can open the door, and simply drive away. You need a duplicate mechanical key. If you don't see the keyhole on your car, do a Google search or read your owners manual (you'd be surprised how many people never open that thing) and you will learn where it is and how to access it. I cannot think of any ordinary car that doesn't have a keyhole, although it may be hidden, and even if your remote doesn't have a visible key, I promise that most of them have one. Again, that's where Google and the owners manual come in real handy. The second place folks consider a hider is their home or business. You can use a magnetic box if you can find metal, or a nylon pouch with velcro. There are also several other things available like fake rocks, fake sprinkler heads, and others. Don't discount the fact that criminals are pretty well versed in this stuff, so they may quickly recognize your plastic rock as exactly that and find your key quickly. Alarms don't keep people out, they just let you know that someone has breached your first line of defense, your locks, so please keep that in mind. 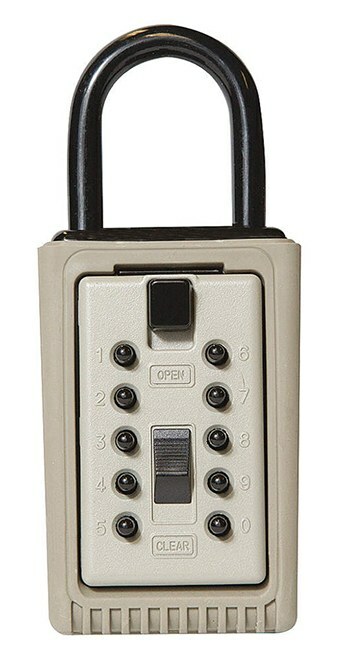 I have installed many locking key boxes, so homeowners have secure access to a spare key. These boxes are more expensive. That expense has a broad range because these can be mechanical or electronic and have different features. The more features and security, the higher the cost. This can be as simple as a realtor-style box that hangs around your doorknob, to a box that screws into your wall. If you decide to use a key hider, use caution in where you place it, don’t tell anyone that you have one, and be sure to get one that has all of the features that you desire.